Deatschwerks takes a unique approach to building high flow injectors. Other fuel injection companies offer only a couple different styles of injectors and leave fitting them up to the customer. Every Deatschwerks injector is a drop-in fitment for its application. 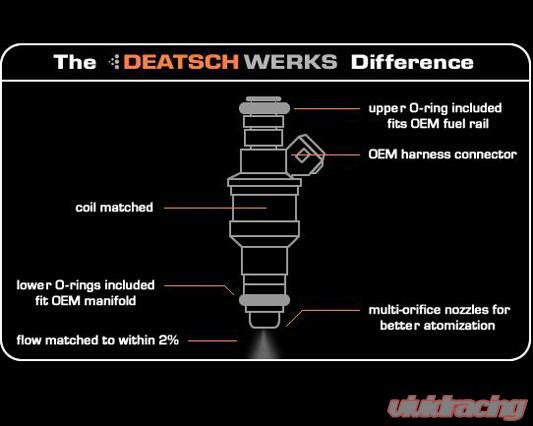 Deatschwerks injectors are engineered to fit the OEM harness, OEM fuel rail and OEM manifold. All Deatschwerks high flow fuel injectors are built using only quality OEM cores. In addition, each set is balanced to within a 2% flow variation. This means better fitment, easier tuning, and increased reliability. Most aftermarket injectors go straight from the production line to the shipping department. Deatschwerks, has added a crucial step of flow balancing and quality assurance testing on EVERY set of injectors they produce - not just one or two from each lot. Over 40 data points are collected and analyzed on each injector to be sure you receive the best end product. All of Deatschwerks testing is performed in-house on their custom built New Age Technologies injector flow bench. Deatschwerks injectors are Direct factory replacements for their listed applications. 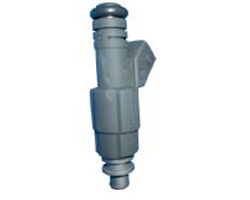 In addition, Deatschwerks offers a comprehensive line of universal injectors which are available for customers whose applications are not listed in their catalog. Their Universal applications include high impedance, low impedance, narrow body, wide body, and several different connector options. Deatschwerks is THE SOURCE for all your fueling needs. At Deatschwerks you will find nothing but the highest quality fuel injectors and fuel pumps. They pride themselves on superior customer service and having an industry leading range of applications and sizes. Vivid Racing is proud to bring you the quality products of Deatschwerks.